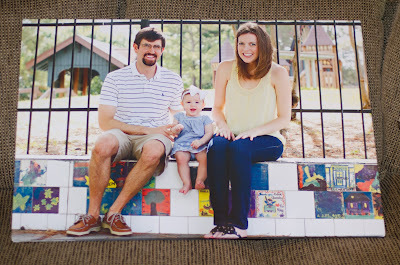 Blessings, Miracles, &Thoughts in Between: Canvas4Life Review and Giveaway! A few weeks ago I was approached by Canvas4Life to see if I would be interested in reviewing their product, and if satisfied, hosting a giveaway for my lovely readers! Y'all will be excited to know that I was more than satisfied which works in your favor! I try my hardest to capture memories of Kate as she grows and changes. I'm actually really impressed with the amount of pictures I've taken over the past 15 months - pictures that capture Kate's sweet smile, pictures of every day life, pictures of our adventures and travels! I've also done a great job of having our amazing photographer capture Kate and our family! The problem? All of these pictures, all of these memories, tend to remain on my computer. Or my external hard drive. Or facebook. Or on the blog. Basically anywhere but displayed in my house. Needless to say, I jumped at the offer to have one of these photos printed on to a canvas! It took me days to narrow down my image. Do I want a picture of just Kate? A family picture? Would it be odd to have a picture of our family of three in the house since we knew we were expecting? Do I want a black and white image? Color? I finally narrowed down my options, polled my friends, and went to designing our custom canvas! Canvas4Life believes in upholding the highest standards, without exception and my experience proved that they are not just all talk; they live their believes! I had a few questions regarding our image and how it would look wrapped on the canvas and customer service was able to help me figure out that it would indeed work! After going through the design process, which was extremely user friendly, I not so patiently waited for a package to arrive! Kate and I were extremely excited when it finally arrived! I was shocked by how fast shipping was! While I drooled over just how beautiful the photo canvas was, Kate enjoyed her first experience with bubble wrap! Win win situation in our house! I really can't believe how beautiful the canvas is! The quality is amazing and the colors are so bright! I just adore this picture and printing it on a canvas really made it even more beautiful! This picture does not even begin to do the canvas justice! I still don't have it hung in the house because I am too indecisive to commit to a wall! But I hope to have it up by this weekend! Canvas4Life has offered all of my readers a lovely 10% discount on any purchase! 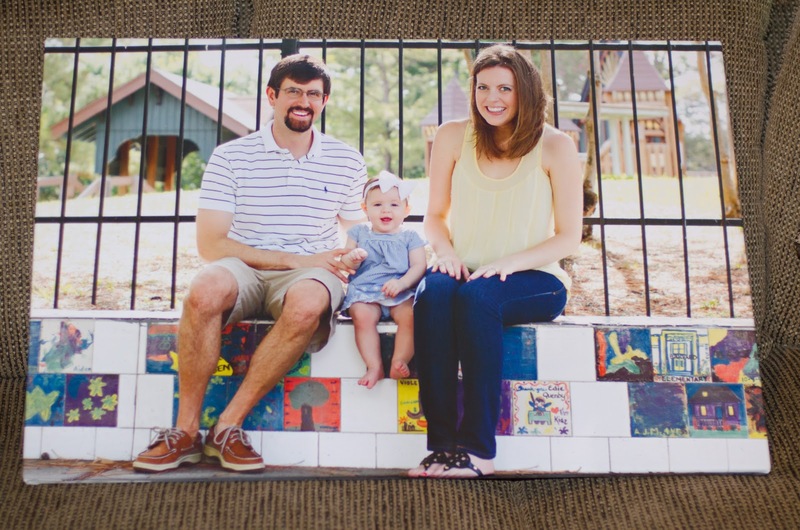 I know just about any grandparent would love to find a canvas of their grandbaby under the Christmas tree! Head on over to their website and enter code FinallyThree10 at checkout for 10% off of your order! But, that's not all! One lucky reader will have the chance to win a $25 Canvas4Life gift card! *Mandatory entry - Leave a comment on this post telling me what picture you would use for your canvas! 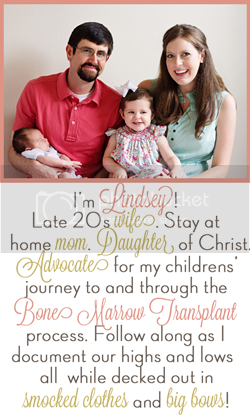 *Tweet the following: @LindseyB34 is hosting a @Canvas_4_Life #giveaway and I want to win! This giveaway will be open until Wednesday, November 16, 2011 at 5om CST. I will randomly select a winner Wednesday night! Happy shopping and best of luck - I can't wait to see who wins! And I cannot wait to order more beautiful canvases from Canvas4Life! This is not mandatory but, if you like giveaways, and want to continue to see them on We're Finally Three, click the button below - a simple click is all it takes to vote. The higher my ranking, the better the giveaways you will see! Thanks! Disclosure: Canvas 4 Life provided me with this beautiful canvas, but my honest opinions were used when reviewing their company and product. This was not a paid post. I would definitely love a canvas of my new grandson! I would pick one of my little munchkin for the grandparents! I would have to pick one of my little munchkin for the grandparents! I tweeted about the giveaway! The picture you picked for your canvas is adorable! I am a follower of We're Finally Three! Gorgeous! I would probably do a canvas of our holiday photo together! I would love to win, and I LOVE your choice! I follow your blog now (also in GR as always)! I follow C4L on twitter, too! I would love a canvas of my twins! I want a picture of my twins! Ps. The canvas is beautiful! You have to get another one when will gets here! I would use a picture of me and my family on the canvas!!! I hope I win!!! I liked Canvas 4 Life on facebook & told them you sent me! I commented and like canvas 4 life on facebook. I would choose a picture of our family- my husband and 15 month old. We have a lot of pictures of just her, but none of all of us together. I would most certainly use a 1st birthday picture of my sweet boy who just turned 1! Also I follow We're finally 3!!! I also follow Canvas4life on Facebook, and left a comment saying We're finally 3 reffered me! I would have to pick one of my two babies to put on my wall! I would probably use it on the picture of Max holding the American flag. I would use it for our upcoming family pictures! I liked their FB and left a comment. Since I just did family photos today, I would have to pick one of those! I would wait until Feb and post a picture after our second child is born of the 4 of us - can't wait!! I have a gorgeous picture I would love to do of Tahoe. I follow We're finally three! I would have to sift through my thousands of pictures of my daughter and pick one for her grandparents. And like you it would be HARD to choose! Also, I'm already a follower of your blog! I would use the photo of us as a family at Ella's birthday party! I would use one of my daughter's NB pics, i have been wanting to get one put on canvas for the longest!